Sometimes words hinder communication. 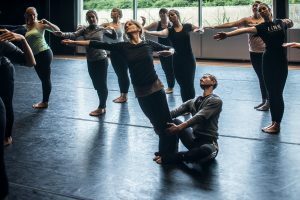 Virginie Mécène and Ari Mayzick (center), veterans of the world-renowned Martha Graham Dance Company, understand this, often teaching with movement only; here, Mayzick supports Mécène as she leans sideways, yearning outward while remaining rooted the ground. Their communication is made of movements and facial expressions, no words necessary. For BYU folk dancers, dance is a way of discovering, sharing, and celebrating the cultures of the world. A Bolivian student has choreographed an unlikely path to dancing success at BYU.